Congratulations and thank you to all our inductees. 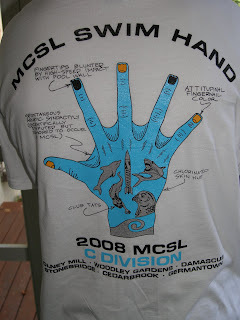 When I was MCSL vice president, I started counting on my fingers and realized I'd be president when the league celebrated its 50th season. This made me a little nervous, and as soon as I stepped into the president's role, I started fussing at the MCSL Executive Board, asking them what we could do to celebrate our half century mark. Robbye Fox, our secretary, said her husband had come up with a great idea--well, he stole a great idea from Georgetown Prep: Why didn't we have a virtual Hall of Fame? I want to publicly thank Pam Ambrose, Bill Bullough, and Greg Fox for their hard work on this endeavor, and thank as well everyone who sent in a nomination. The Hall of Fame has been a work in progress, evolving as we felt our way, and it will continue to evolve. We are inducting a limited number of people this year--their names will be announced this morning at the Individual All Star meet and on this blog after the meet. Over the winter, we’ll design a Hall of Fame web page that will list short biographies of each individual and then we will present their awards during next season. 1. Far-reaching impact. Inductees should have distinguished themselves beyond their home pools. Many people nominated truly wonderful individuals who've done very significant things for their teams. These folks would be excellent candidates for a hall of fame at their pool--and we think that would be a great thing for teams to start. But to be inducted into the MCSL Hall of Fame, an individual should have contributed at the league level or been recognized for their achievements beyond the MCSL. 2. Significant, long-term impact. An individual should have had a significant effect for some extended period of time. We looked at the breadth and depth of a person's contributions. We want to recognize those nominated individuals who met many of the qualities for induction into the Hall of Fame. They have made significant contributions to the league and may well be inducted in future years. And we hope you will all nominate many more individuals--parents, coaches, and swimmers--who have contributed significantly to the league’s development and the quality of its swimming. At this time we aren’t--with one notable exception--inducting people who are still actively involved in the league. I give you the 1965 Glenwood Tigers. I'm the lovely young lady sitting in the front row with the Glenwood jacket and hair band, fourth from the right. I'll let the other MCSL swimming folks identify themselves if they wish to--there are at least two former or current coaches in the crowd. It's been a great season. I hope you've enjoyed this blog and the other things the league and the teams have done to mark our 50th anniversary. Tomorrow at Individual All Stars I'll announce our inaugural class of Hall of Fame inductees--and those names will be posted here afterwards and placed on a Hall of Fame web page that will be developed over the winter. That will be my last post--like many of you, I'm heading out of town, catching a plane to San Francisco for a little sightseeing and a professional conference. (I do hope I manage to get a shower between All Stars and airport.) Then it's time to catch up on all that work that didn't quite get done during the season--I'm sure that sounds familiar to many a team rep! I have book revisions I managed to get an extension on till mid-August. If you're interested, MCSL has two boxes of documents at the Montgomery Historical Society. I hope to find time this winter to poke through the papers and maybe flesh out the skeleton league history we currently have. So if you still have questions or history bits to share, please email them to me at president@mcsl.org. Have a great August everyone--and do stop by tomorrow to read the Hall of Fame information and inductees. Oh, and one final bit of housekeeping. I'm going to turn off the comments when I head to bed tonight--which will be early because I'm the designated donut buyer for the All Star meets. Since I'm truly going to be scrambling to get my plane tomorrow, I won't have time then--and I don't know that I'll have a chance to get on the Internet while I'm gone. Plus, there's that bit about book revisions, remember? My editor is only so understanding. But, as I mentioned above, if you still have things to share, you can send them to me--just don't expect a reply until September at the earliest! Manor Woods is not so unusual. Dave--from Glenwood, my aquatic alma mater--collected a list of over 20 families who have two generations in the MCSL, sometimes at the same pool but more often at different pools. And a few more multi generational folks have stopped by this blog. We haven't yet uncovered a three generation family, however, though there certainly could be some out there. 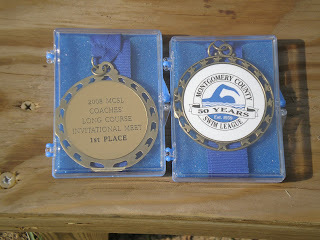 I find it wonderful how special MCSL has been to so many people--even those of us who weren't stellar swimmers. I know when I went house shopping, I told the real estate agent I wanted a neighborhood that had a pool with an MCSL team. 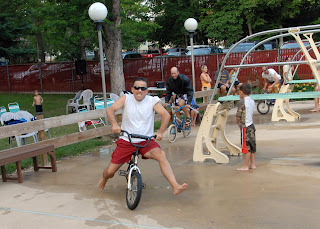 I fondly remember riding my bike to Glenwood and seeing my summer friends, sitting up on the hill eating candy during swim meets (not an approved activity in our modern swim world, btw! ), and feeling physically fit and more than competent in the water (I had no trouble passing my high school and college swim tests.) I wanted that experience for my kids--and I have to say, as the "baby" graduates from MCSL this weekend, I got it many times over. I even found I enjoyed--for the most part--being a summer swim parent. I walk, not bike, to the pool, but I still have my summer swim team pals--the parents of my sons' teammates. But I think the best testament to how wonderful MCSL swimming is was left by Mark in the comments here. Every Friday following afternoon practice, Manor Woods has a spirit activity at 5 pm and pasta dinner at 6 pm. 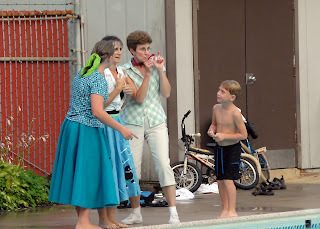 On this particular day, we continued the festivities with a 50s party from 7-8. We had a DJ playing music, dancing, a limbo contest with the kids, and a show. The actors in the show are part of a long-standing group at MW called the CoffeeMates. They are dads who are willing to make fools of themselves so that others might be entertained. Here is the story behind this show. Cool greaser guys ride around the pool on motorcycles (i.e. small bikes with motorcycle sound effects), flexing their muscles and generally trying to impress each other and the attending ladies. Weird nerdy guy comes by and gets thrown into the pool. Greaser guys challenge each other to a race. They leap into the pool, taking their time with various strokes, still looking to impress. The ladies are NOT impressed, so they encourage one of their own to outshine the guys. She takes off her poodle skirt, dives in, laps the guys who then try to figure out what just happened to them. Beat by a girl! 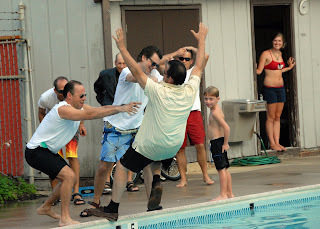 The kids were treated to their favorite line dances Cotton Eye Joe and the Cha Cha Slide, and were joined by parents and the non-team pool members that happened to be there at the time. 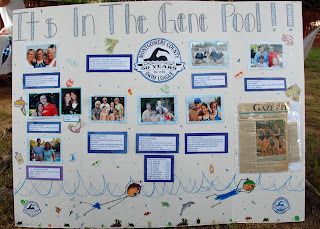 We also featured a display board that showcased the multi generational families on our team and a Gazette article from 1994 about the 25th anniversary of the pool. It was viewed with great interest. And we discovered at least one more family that should be added. Everyone had a great time! Lisa mentioned place judges here. I swam during the time place judges were used, but I don't remember them--too bad, as it sounds as if they were quite the amusing spectacle. If I am understanding the rule correctly, each judge was assigned a place--1st, 2nd, 3rd, or 4th. They stood on the sides at the finish end and decided which swimmer had come in "their" place. Once a judge made his decision, he would go to that lane. And here's the fun part--they held ping pong paddles or badminton rackets (people have reported both) with the place they were judging displayed. It's a wonder parents didn't start whacking each other when the race was close. One of my informants thought place judging was stopped at least partly because parents couldn't always be impartial when their children were involved. Mary P. remembers that the place judges trumped the watches' times, so the race winner might have a slower time than the second place finisher. Bill R. remembers in his last all-star (championship meet) at Rockville Municipal Swim Center in 1970, the 50 fly was very close--only 1-2 tenths separated 1st through 4th. The 2nd, 3rd, and 4th place judges all came to his lane. It was then up to the referee and sweep judge to sort out. He ended up 4th. 1. The season used to start later. 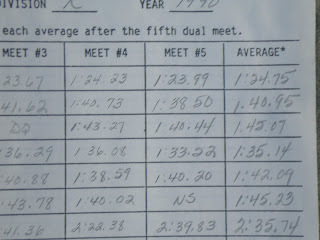 In 1971, the first meet was held on July 3; divisionals was August 7; and the All Star meets were August 14 and 15. 2. Back when I swam, you had to hang up your goggles--except we didn't have goggles--after you were 17. The 15-17 events weren't changed to 15-18 until 1975. 3. Up until about 1967, kids who swam on winter swim teams were not allowed to swim in the MCSL. I wonder how things will have changed by the league's 60th season? There have also been Montgomery Village teams such as Northgate and Stedwick that have stopped competing, but the swimmers from those teams just move over to another Village pool--the Village is a special case. Of the 8 pools I've listed, I think only 3 still exist--Cinnamon Woods, Carter Hill, and Pleasantview. (At least I hope these 3 are still around.) The others were sold to developers and have houses instead of water on their property. Costs are high for community pools and many have struggled to make ends meet. Park Forest had an added challenge--a fire destroyed a good part of its property. Back to Merlands. Here's what happened, according to my informant, Bill Bullough: "To the best of my recollection (and my recollections are somewhat foggy these days) I was coaching at Merlands the day it was closed. The land was privately owned by an old [gentleman] who acquired the property through connections he had in the Truman administration. The club [Board of Directors] members had a lease with an option to buy. At the end of the lease the [gentleman] did not want to exercise the option because the land was worth so much. To break the option he tried to prove the property had not been kept up by showing pictures of the pool in March etc. He got an injunction to close the club until the trial. The county sheriffs came to the pool unannounced while I was coaching and sent everybody home and locked it up. It was just before the Divisionals and we had a good team, but no pool. Daleview was nice enough to allow us to practice there after their own practice. The coach that year was Jack Graham, who is the currently principal of Good Counsel! "[The gentleman] had the trial delayed over several years and moved to Denton MD where he knew the judge. I use to go to the hearings. The members without a club, and assessments to pay the lawyer, finally gave up. The property reverted back to [the gentleman] who sold it to a developer who built the Foxhall community between Glenmont and Aspen Hill." Lisa from Woodley Gardens suggested I publish some of the divisional t-shirt designs. You can see why she made the suggestion--here are two designs (yes, they gave people a choice) from Division C. The front of the shirt had the 50th anniversary logo. These are pretty impressive, huh? If anyone else would like to email me a jpeg of your division's shirt, I'll be happy to post it. Are any kid sports banquets as elaborate as the summer swim team's? My kids played basketball, baseball, and soccer, and about the most we ever did was go out to a fast food eatery. But the swim team end-of-season event includes speeches, awards of all sorts, and a slide show. (One year we had a play complete with scenery, but that was admittedly a bit over the top.) We even had a banquet in the Old Days. I remember at least one or two occasions where Glenwood celebrated a season well swum at that famous Wheaton former eatery, Anchor Inn. 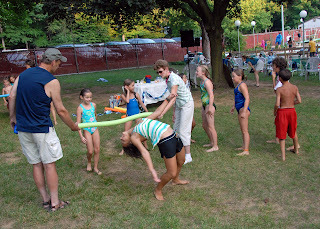 I think I'll like getting my Saturday mornings back, but I know I'll miss the fun and excitement of summer swimming--lathering that sunscreen on, seeing my sons swim, watching the little 8 & unders attempt the butterfly, chatting with parents I see only in the summers, but whom I have seen summer after summer for over a decade. I won't be leaving MCSL swimming--I have another year as president and we usually don't kick the past presidents off the board immediately. But I also suspect I'll be strolling over to Rockshire from time to time to watch a home meet and see my summer pals. Yesterday I talked about how teams place in their divisions based on their win/loss records and their performance at the two divisional meets. You might assume that the division winners would move up a division next season. You'd be wrong. They might move up one or two or several divisions--or they might stay where they are. It is even theoretically possible that the division winner could move down. How could that be? Simple. A team's division assignment isn't based on this year's meets--it's based on this year's times. If you study the division assignments in our handbook very carefully--yes, you are a geek!--you'll see that, particularly in the middle of the league, sometimes a team with fewer points is in a higher division than a team with more points. It's wins that count here, with points only being used to break ties. While there is a significant difference between Division A and Division O, there is not so much difference between Divisions D, E, and F, for example. So it wouldn't be surprising for teams to bounce a couple divisions up or down from year to year. How do we get the times for this computerized swim off? It's easy now--you can just upload the file. But in the Old Days before the league was computerized, the rep--or some poor soul--had to write down all the times for every meet. (Below you can see--if your monitor is good and my camera skills don't prove completely terrible--a copy of the "MCSL Swimoff Worksheet" from 1990. The top two pictures are close ups of the third. 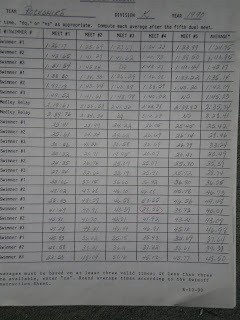 This version had 5 pages and didn't capture the first heat of the double heat freestyle events.) Someone then entered the averages into a computer for the swim off...I think. And in the Old, Old Days before personal computers were around? 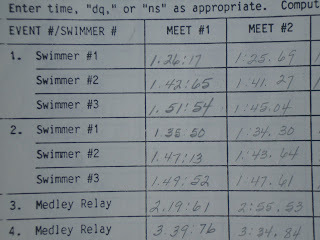 Then I think we did "time in water"--adding up all the swim times. The teams with the fastest swims--and so the lowest number--were in "A." But anyone with more information--please feel free to correct me! During Relay All Stars, I'll be presenting enormous trophies to the teams that finish first, second, and third in each division. How do we decide who gets these awards? Rule 14 explains all, but in case you don't have your handbook handy, here's how it's done. Teams get points for dual meet wins and for their placement in the two divisional meets (relay carnival and the division championship). The total of those points determines where they finish in their division. Teams get 6 points for each dual meet win, and no points for losses. If the final dual meet score is a tie, the 6 points are split--each team gets 3 points. So a team that wins all 5 dual meets ends up with 30 points. In a normal six team division, the team that wins the division relay carnival gets 10 points. Second place gets 8 points--and on down in 2 point steps to sixth place--zero points. The point scale for the division championship (divisionals) goes from 20 to zero in 4 point steps. Sometimes there's one really strong team in a division. It wins all its dual meets (5 x 6 = 30 points), comes in first at relay carnival (10 points), and wins divisionals (20 points) for a season total of 60 points. No surprises there. But sometimes calculating the division champion is more interesting. As an example, let's look at G division, since I have a swimmer there. If I did the math correctly--a big if--Old Georgetown and Tallyho both won four meets, so they each have 24 dual meet points. Old Georgetown won relays (10 points) and Tallyho placed second (8 points), so going into divisionals OG has 34 points and TH has 32. Very close. Who will win Division G? If Old Georgetown wins divisionals, then it wins the division. But if OG comes in second at divisionals (16 points) and TH comes in first (20 points), Tallyho wins the division: TH (20 + 32 = 52) to OG (16 + 34 = 50). And we can't rule out the come-from-behind possibilities. For example, if Robin Hood, the current third place team, has stellar swims and OG and TH don't--or if a few of key OG and TH swimmers are sick or out of town--and RH wins divisionals with TH third and OG fourth, then RH (24 + 20 = 44) and TH (32 + 12 = 44) tie for first in the division and OG ends up with third (34 + 8 = 42). If you win your division, does that mean you'll be in a higher division next season? No--but that will be tomorrow's blog topic. It's time to look at the All Star seedings--both for Relay All Stars and for Individual All Stars--and send in your scratches. You can find the details about scratching here. Scratches for Individual All Stars are due by 6pm on Sunday, July 20. With regard to Relay All Stars, please note that swim ups are not permitted (see Rule 16e), so if all your 13-14s have left town, you'll need to scratch that 13-14 medley. Please get your scratches in promptly so that events can be seeded properly and the next swimmers down the list or the alternate relay teams can plan to be on deck! Our 50th season is beginning to come to an end. My team had its "B" relay carnival last night. This Saturday is divisionals, the last meet where our swimmers really compete as teams. The end-of-season banquet is right around the corner. After Sunday, only the kids going to Relay or Individual All Stars will still be coming to practice, and by the following Sunday, many pools will be deserted. I'll be keeping the blog open until July 27th. I have a few topics I'm still planning to cover, but it you have a question you've been dying to ask, now's the time to ask it. I can't guarantee answers--I'm still working on that place judging question Lisa asked here (though I have gotten some input on that)--but I'll do my best. Early in my career as a team rep, I was fortunate to hire a young woman who was a wonderful coach. She was also a frustrated theater director, I think. She created the most amazing psyche ups before our swim meets. One of her most ambitious projects was staging a mini Star Wars complete with light sabers, Chewbacca, Princess Leia, and a host of 8 & under Yodas. Her psyche ups amused the parents, delighted the little kids, and caught the imagination and the enthusiasm of the older swimmers. 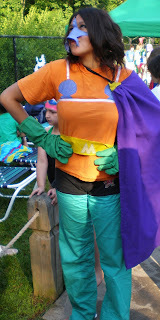 Anyone out there in blogland have a favorite psyche up, cheer, or other spirited activity from your MCSL days to share? As promised, here's the list of MCSL mascots from most popular to the more unique. And now the mascots that represent only one MCSL team: Chargers (CA), Sun Devils (CG), Feet (D), Demons (DT), Frogs (FV), Lady Bugs (GP), Torpedoes (GER), Hurricanes (HA), Hellcats (H), Nessies (IF), Jellyfish (JC), Kangaroos (KM), Tsunami (K), Kingfish (KL), Screamin' Geese (KFM), Lasers (LM), Lionfish (LLD), Penguins (LF), Water Wizards (LB), Terrapins (MW), Maniacs (MM), Indians (MO), Anacondas (NH), Neptunes (NO), Octopi (O), Eagles (OF), Porpoises (PA), Devils (PW), Arrows (RH), Sailfish (RE), Fins (RC), Serpents (SG), Foxes (TH), Tarpon (TA), Ducks (TB), Thunder (WTL), Wahoos (WCF), and Wombats (WM). 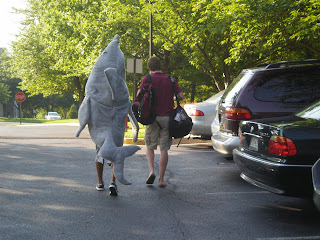 Did you guess "C. Dolphin" as the most popular MCSL mascot? If you did, you are correct! Twelve teams call themselves the dolphins. (I included the MCF blue dolphins in this group.) Here's the number of teams that have one of the other four aquatic critter mascots: alligator/gators--6 teams; barracudas/cudas--5; sharks--6 (including NCC's more creative spelling, sharx); and stingrays/rays--3. How about the non-mascot? Did you pick out koalas as the cuddly animal no MCSL team has yet to adopt? Give yourself a star if you did. The other animals...or body parts...all have an MCSL team: the Old Farm eagles, the Daleview feet, the Garrett Park lady bugs, and the Wildwood Manor wombats. Tomorrow I'll give you my complete list of mascots--and please correct me if I got yours wrong! 1. 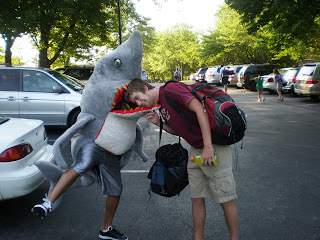 Which creature is the mascot of the most MCSL teams? 2. Which of the these is NOT an MCSL mascot? Tune in tomorrow for the answers! Time to finish up my list of when teams entered the MCSL. Another nine teams joined the league in the 21st century. 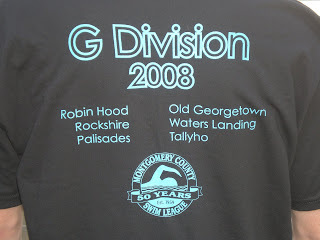 Not all were brand new teams, however; a number came to the MCSL after competing in the Gaithersburg Germantown Swim League. Brian's comments had me emailing Linda, the MCSL records chair. She's researching the question. It also got me to haul out my ribbon box. Yes, I confess I have a very old Woodies box (for you non-natives, Woodies, aka Woodward & Lothrop, was a local department store that closed its doors some years ago) filled with ribbons and medals...well, mostly ribbons and mostly third places (back then, we only got ribbons for 1st, 2nd, and 3rd). Anyway, digging through the pile of over 100 ribbons, I found two that recorded the time to hundredths--one from 1967 and the other from 1964. Hmm. I suspect another trip to the Montgomery County Historical Society might be in order. Oh, and in the same post where I first mentioned times, I said Glenwood didn't have lane targets back in the day. Apparently it wasn't the only pool with blank walls. Brian wrote that when he swam for West Hillandale in the 1960's, opposing teams sometimes marked targets on the pool walls with crayon! Don't forget the reps meeting tonight. We have lots of things to talk about, but most importantly perhaps, the reps need to vote on next year's calendar. I'm beat. As I write this, I'm just home from the Coaches' Invitational Long Course meet. It was HOT, but thankfully we didn't have any thunderstorms. Many thanks to Marty and our stellar competition committee as well as all the great officials on deck. There seemed to be a lot of fast swimming--the results should be up on the web site shortly. To celebrate the League's 50th season, we had banners made for the eight charter teams still competing. We hung them up for the first half of the meet and then presented them to the teams at the break. This year's awards also celebrated our 50th--they all featured our 50th logo. One of the highlights of the meet for me happened at the break. For a number of years, the Auer family has presented college scholarships to graduating seniors in memory of their daughter Sarah, who was killed in an car accident on her way to coach her winter team. Before the meet, I got talking to the mom of one recipient--her daughter had no idea she'd won the award, so the mom had to be a little evasive as to why she was there. All three winners seemed genuinely delighted. Here they are with the Auers. At the end of the meet, I helped Debi sort the medals into each team's bag. I'm delighted to say I think all but one team picked up their goodies. The competition crew, efficient as always, got everything packed up and stored, ready for All Stars. Maybe I'll have recovered by then and be ready as well. 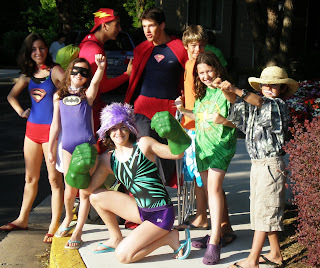 Here are the MCSL swimmers whom our reporter on the spot, Robbye Fox, could capture on "film." Front row, left to right--Sean (WG), Cara (RV), Colleen FV), Chris P (NO). Back row--Chris G (RF), Ryan (RF), Brady (HA), Adam (CS), Eric (TW), Mark (CS). Not pictured, Katura (RV) and Liz (RF). Well swum, guys (and gals)--congratulations !! Tomorrow night is the 34th Coaches' Invitational Long Course meet. The eight fastest MCSL swimmers in each event--taking into account scratches and event limits--will be in the pool, including many of our Olympic Trials athletes who are just back from Omaha. Coaches' Invitational Long Course is an MCSL meet, but it's also sanctioned by USA Swimming, so we'll have USA Swimming certified officials on deck. But how did this meet get started? Frankly, the answer is a little murky--at least to me. 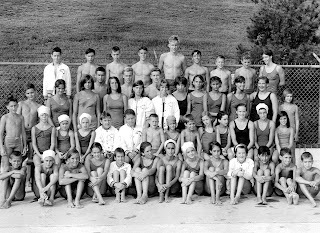 The MCSL history says the first Long Course Invitational Meet was held on August 17, 1964, at Twinbrook pool with 34 scheduled events. But if we counted from 1964, this would be the 44th meet--so what's up with that? 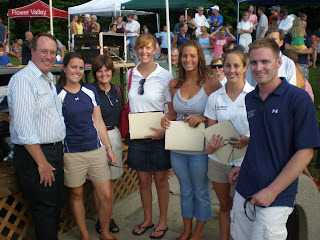 "We met at Woodley Gardens Club House and, with a lot of food, drinks, etc., and many coaches, seeded the meet by hand. This was about a three hour process. The coaches ordered and labeled all of the rosette ribbons and ordered and designed the t-shirt. Shirts were first donated by Sonny Sollott Swimwear and then Aardvark. 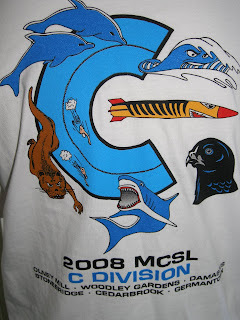 Most of the shirts in the 80s were designed by a swim parent (Carol Slothower - QO). The shirts were a big hit and motivation to qualify for the meet. 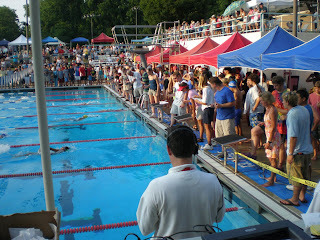 "The meet was first held in the old RMSC outdoor pool (7 lanes). It was officiated, timed, announced, and completely run by coaches. We went to PVS officials when we realized that the times were becoming very fast and swimmers were qualifying for Juniors, Seniors, and Olympic Trials. The meet needed to be sanctioned, and there needed to be USS officials starting, refereeing, and stroke and turning. "All of the greatest MCSL Alumni have swum in this meet: Clay Britt, Mike Barrowman, Dan Veitch, Pamela Minthorn, Kelly Davies, Scott Meredith, and even NFL star Dhani Jones." Back in June, I listed the pools that joined the league up through the 1980s. I haven't forgotten about our more recent members. In the 1990s only nine pools joined the MCSL, one of which--Diamond Farms--was actually coming back to the League after a four-year hiatus. When I was looking for information on those old swimsuits I talked about here, I came across this great article from USA Swimming. I never swam a race without lane lines--can you imagine how crazy that would be? Bill Bullough tells me when he first swam at Glenwood they did have lane lines, but they didn't have lane targets (those marks on the wall at the ends of the lane) or any black lines on the bottom of the pool. Turning was a little more like bouncing off the wall. I do remember the old kind of lane line. They were ropes with buoys. The buoys slid along the rope like beads on a string. One of the meet set up jobs was to space the buoys out so they kept the ropes afloat. You sometimes still see these kinds of ropes separating the "L" portions of pools from the competition lanes. I also remember the old sweep hand stopwatches--as the article says, think "60 Minutes." Times were recorded only to tenths--that's why our really old records have no hundredths digit. We moved to digital watches around 1981. And can you imagine life without swim goggles? Ouch. Though it's probably easier to manage without goggles in MCSL than in USA Swimming programs since we have outdoor pools and relatively short practices and short competitive events. But what would all our contact lens wearing kids do? Have fun--but don't be out too late. There's a swim meet in the morning! Speaking of swim attire, I've been watching the Olympic Trials and marveling at the swimming, of course, but also at those fancy swim suits. Very sleek--and if I can be just a touch indelicate...well, I just hope none of those elite athletes needs a pre-race potty break. In the Old Days, our swim suits weren't quite so fancy. They were made of nylon, if I remember correctly. Marcia mentioned in the comments here that girls used to tie their straps together with shoelaces so the straps didn't slip down over their shoulders. I vividly remember one unpleasant backstroke race where my range of motion was severely curtailed by a wayward strap. Picture a penguin trying to swim on its back. And that thing in front she referred to? For some reason I don't understand, there was a panel down the front of the suit. It wasn't much of an issue at the pool, but it could become quite the liability at the beach. When you were tumbled around in the waves, sand worked its way up the panel, through the straps, and down to the seat, giving you a rather droopy rear appearance--not a good look. The only way to get the sand out was to take the suit off--at home, of course--and work the sand back the way it had come--up the back, through the straps, and down the front to drop out the open panel at the bottom. I tried to find a picture of one of those suits, but, sadly, I didn't have any luck. Here's a link to Speedo's history as an alternative. Olympic Trials update--Ryan made the finals of the 200 breaststroke! And according to Robbye's blog (If you haven't been reading her posts, you definitely should be! ), Eric qualified for the World Youth Championships in Monterrey, Mexico and will be leaving for them directly from Omaha. Lots of MCSL swimmers competing today, so try to catch those prelims--and, of course, the finals. Ryan Hurley and Eric Friedland both made it back for the 200 breast semi-finals!! Ryan is ranked 5th and Eric just squeaked in at 16th. Tune in to USA tonight, 8-9 pm, to watch a current MCSL swimmer (Eric) and an MCSL alum (Ryan) compete with the best US breaststrokers. Now that the seedings are up for the Coaches' Invitational Long Course meet, it seems an appropriate time to mention the MCSL rules regarding proper meet attire. We encourage, but do not require, swimmers at dual and divisional meets to wear their MCSL team suits and caps. Still, many kids wear gear from their winter teams, and that's okay for these smaller meets. However, it is not okay for our league invitational meets. Remember, at Coaches' Invitational Long Course, All-Star Relays, and Individual All-Stars, swimmers cannot wear winter team suits and caps. Here's the exact language from the rule: "A swimmer shall not wear a suit or cap bearing the name, insignia, or logo of any team or pool other than the MCSL team represented by the swimmer." In a pinch, it's okay to turn your cap inside out so the non-MCSL team logo isn't visible. Turning a suit inside out is a bit more of a problem, so you might want to check your swim wardrobe now rather than on deck Tuesday. You'll probably hear outrage on your pool deck if one of your best swimmers gets DQ'd at a meet. He/she couldn't have done whatever the DQ stated, people will say, because he/she swims year round. I mentally roll my eyes when I hear this, though I do understand. At a dual meet a few years ago, my then 13-14 swimmer got DQ'd for a one hand touch on the fly to back turn in the IM. I was flabbergasted, but I was also the starter, so I couldn't do more than make a note to ask my son after the meet. His response? Oh, yeah, it happens more times than you think. I was watching the Olympic Trials 100 breaststroke prelims on Sunday, courtesy of NBCOlympics.com, when I heard the announcer say one of the swimmers had been disqualified for a one hand touch. Yes, at the Olympic Trials. Those turn judges at the ends of the lanes and the stroke judges walking the sides aren't just there for decoration. Even good swimmers can make mistakes. They are in a bit of a hurry, after all. 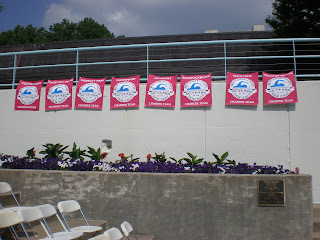 The MCSL was established in 1959 to provide organized, friendly swim team competition for children at the neighborhood pool level. The League operates from Memorial Day to the end of July. Visit our homepage at http://www.mcsl.org/. Sally MacKenzie is a writer who swam for Glenwood from 1962-1971. She is currently in her 19th and last year as a swim mom at Rockshire. She is also president of the MCSL and can be reached via email through the MCSL web site.